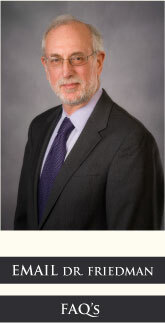 Dr. Howard J. Friedman is board certified in neuropsychology by the American Board of Professional Psychology, and a fellow of the American College of Clinical Neuropsychology and the American College of Professional Neuropsychology. A leading Bay Area clinical neuropsychologist, Dr. Friedman has worked with clients in California, New Mexico, Arizona, Texas, and Utah for the past 26 years. His private practice in Walnut Creek, CA, specializes in psychodiagnostic assessment, consultation, and forensic evaluations. Dr. Friedman is a Designated Psychologist for the U.S. Department of Energy Human Reliability Program at Lawrence Livermore National Laboratory and Sandia National Laboratories. He has also served as the Director of Psychological Services for Walnut Creek Hospital and a consulting neuropsychologist for the Adolescent Treatment Center at John Muir Medical Center. Dr. Friedman is a member of the National Academy of Neuropsychology, the International Neuropsychology Society, the American Psychological Association, the California Psychological Association, the Northern California Neuropsychology Forum (president, 2007-08) and the Contra Costa Psychological Association (president for three terms, 1985-1988). He has published numerous articles in journals including Pharmacology, Biochemistry and Behavior, and Proceedings of the National Academy of Sciences, and has presented research at conferences of the American Psychological Association and the National Academy of Neuropsychology, among others. Dr. Friedman earned his Ph.D in psychology from Rutgers University and completed an interdisciplinary postdoctoral fellowship at Langley-Porter Neuropsychiatric Institute.